Although it won’t be obvious to UCSF Medical Center patients, behind the scenes a family of giant robots now counts and processes their medications. With a new automated hospital pharmacy, believed to be the nation’s most comprehensive, UCSF is using robotic technology and electronics to prepare and track medications with the goal of improving patient safety. Not a single error has occurred in the 350,000 doses of medication prepared during the system’s recent phase in. 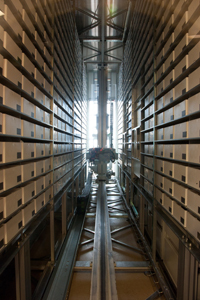 The robots tower over humans, both in size and ability to deliver medications accurately. 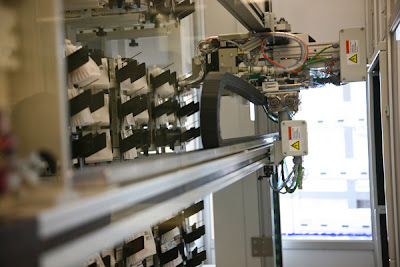 Housed in a tightly secured, sterile environment, the automated system prepares oral and injectable medicines, including toxic chemotherapy drugs. In addition to providing a safer environment for pharmacy employees, the automation also frees UCSF pharmacists and nurses to focus more of their expertise on direct patient care. The new pharmacy is the hub of UCSF’s integrated medication management system which combines state-of the-art technology with personalized care. The new pharmacy currently serves UCSF hospitals at Parnassus and Mount Zion and has the capacity to dispense medications for the new UCSF Medical Center at Mission Bay, scheduled to open in 2014. As the phase-in continues, additional steps in the process will be eliminated as doctors begin inputting prescriptions directly into computers in 2012. “We are intent on finding new ways to improve the quality and safety of our care, while increasing patient satisfaction,” said Mark Laret, CEO, UCSF Medical Center and UCSF Benioff Children’s Hospital. “The automated pharmacy helps us achieve that and at the same time, advance our mission as a leading teaching hospital and research institution. Studies have shown that technology, including barcoding and computerized physician entry, as well as changes in hospital processes for medication management, can help reduce errors. The pharmacy also will enable UCSF to study new ways of medication delivery with the goal of sharing that knowledge with other hospitals across the country. Once computers at the new pharmacy electronically receive medication orders from UCSF physicians and pharmacists, the robotics pick, package, and dispense individual doses of pills. Machines assemble doses onto a thin plastic ring that contains all the medications for a patient for a 12-hour period, which is bar-coded. This fall, nurses at UCSF Medical Center will begin to use barcode readers to scan the medication at patients’ bedsides, verifying it is the correct dosage for the patient. The automated system also compounds sterile preparations of chemotherapy and non-chemotherapy doses and fills IV syringes or bags with the medications. An automated inventory management system keeps track of all the products, and one refrigerated and two non-refrigerated automated pharmacy warehouses provide storage and retrieval of medications and supplies. By using robots instead of people for previous manual tasks, pharmacists and nurses will have more time to work with physicians to determine the best drug therapy for a patient, and to monitor patients for clinical response and adverse drug reactions. In addition, the new pharmacy offers a rich training ground for pharmacy students in the medication distribution systems of the future. Robotic pill picker and plastic bags for medication. The facility, located at Mission Bay south of downtown San Francisco, has been awarded LEED-CI Gold certification for its sustainable building practices.